When a controversial issue in science is politicized and seems to become a fad, does an ordinary person have the tools to judge whether it is likely to be good science, or junk science carried along by scare headlines and politically-correct institutional group think? Well, the ordinary person has some advantages that academic scientists often lack — such as common sense, a disinterested objectivity, and freedom from peer pressure or political agenda. He does not need to worry about rejection of his doctoral thesis or denial of tenure if he says something heretical to establishment science. The ordinary person is not trained in the currently prevailing paradigms of institutional science, and he is able to see things that the intensely specialized graduate studies and tightly focused paradigms of the academic world tend to filter out. With that in mind, let's take a look at global warming. First, we shall consider a "smell test" that an ordinary person can employ with the help of common sense. Then, if the global warming movement does not pass the smell test, we shall build upon scientific facts that are available to a bright college freshman to evaluate whether the global warming theory is likely to be valid. Liberal syndicated columnist Nicholas D. Kristof was once an enthusiastic environmentalist, but says, "I'm now skeptical of the movement's I-have-a-nightmare speeches." He said in a recent column, "The fundamental problem, as I see it, is that environmental groups are too often alarmists. They have an awful track record, so they have lost credibility." He recalls the warnings in the seventies that the Alaska oil pipeline would decimate caribou herds. The herds have increased five fold since then. Kristof also recalls panicky warnings in the seventies of global cooling and the disasters this would bring to the world. Allegedly, the meteorologists were nearly unanimous in their predictions of global cooling. Kristof mentions other scare warnings that did not come true, such as disastrous overpopulation in Asia, famines, nuclear winter, and radical changes in the weather. The things that disillusioned Kristof give us a simple smell test: 1) scare warnings of impending disaster; 2) assertions that scientists are unanimous; and 3) politicalized groups that have a bad track record in their predictions. Let us add a fourth item to the smell test. When the conventional view is challenged, do the proponents refuse to answer the facts and logic of the challenge? One of the founding principles of empirical science is to attempt to falsify every hypothesis and accept only those hypotheses that cannot be refuted. The mark of good science is the willingness to discuss the intelligent criticisms of a hypothesis. The refusal to consider and discuss intelligent criticism based upon facts and logic is the mark of group-think junk science. The evasion of criticism is invariably accompanied by changing the subject. As a fifth smell test, look for the following kinds of ploys of redirection: a) "You are not qualified to question science," b) "All scientists say X; therefore, anyone who questions X is not of science," c) "You must be motivated by political loyalties, economic vested interests, or religious beliefs if you question X," d) "You must be ignorant or lacking intellectual honesty if you question X," e) You desire a personal insult that demonizes you and casts you in the role of a monster, an enemy, or a fool. This is how Hollywood answers her critics: cast them as a demon or a crank in the next movie. It is an old cartoonist's technique that goes back to Michelangelo who is alleged to have painted the face of Pope Paul III on the devil in The Last Judgement. Readers who wish to try the smell test might go to any Environmentalist or Global Warming interactive web site with an intelligent criticism and see if they can get an intelligent answer. If the Global Warming advocates flunk the smell test, should one join with Horatio and say "Something is rotten in the state of Denmark"? Not at all. If we jump to hasty conclusions, we become just as bad as the partisans of junk science. If we fail to make a solid case of our own and manipulate science just to confute the junk science partisans, we acquire a bad smell of our own. The smell test is merely a warning signal that we need to investigate further. How shall we proceed? Start with the known facts and ask serious questions. What follows is my attempt to do just this with facts readily available to any college freshman. The global warming theory is based upon the concept of a greenhouse effect. In brief, the greenhouse effect occurs when the ground is heated from sunlight and radiates the heat into the air, and the escape of heat into the stratosphere is slowed by elements in the lower atmosphere. Global warming theory holds that the increase of carbon dioxide (CO2) in the air due to automobile exhaust and industry emissions has intensified the greenhouse effect and is causing global warming. A few scientific basics about the atmosphere are needed before we can think intelligently about the greenhouse effect. Our atmosphere consists mainly of nitrogen, oxygen, carbon dioxide, water vapor, and dust. All these elements are directly or indirectly necessary for plant and animal life on earth. Each of these six elemental substances is taken from the air and replenished to the air in a regular cycle. 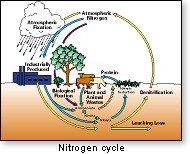 Nitrogen cycle: 78% of the air consists of nitrogen. Bacteria fixate nitrogen gas from the air and form nitrogen compounds. Tiny insects consume the bacteria, and these in turn are eaten by larger animals and birds that digest the nitrogen compounds and use it in organic tissues. Animal feces and the decay of dead animals goes through a process of putrefaction in which ammonia is produced. Ammonia, which has a strong odor, releases some nitrogen into the air and returns some nitrogen into the soil. Plants use nitrites in the soil as a nutrient. Dead plants putrefy, produce ammonia and release nitrogen to the air and the soil. 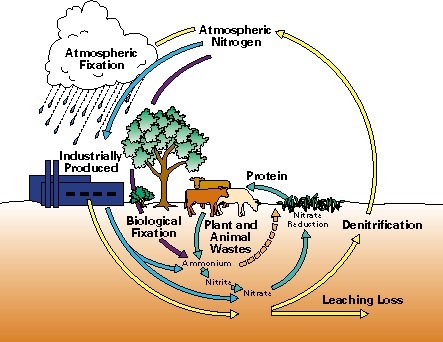 Atmospheric nitrogen is an inert, colorless, odorless gas, and has no known influence on the greenhouse effect. agricultural productivity has compensated for oxygen lost from deforestation and oxygen consumed by forest fires and industrial use. Oxygen is a colorless, odorless gas that has no known influence on the greenhouse effect. Carbon dioxide cycle: Plants consume carbon dioxide (CO2) from the atmosphere in the process of photosynthesis. Carbon is removed from the CO2 and is processed into plant fibre. When a tree is burned, the charred wood and ashes consist mostly of carbon. Animals eat plants and integrate some of the carbon into their bodies. Life on earth is carbon-based, and the source of that carbon is carbon dioxide in the air. CO2 in the air is replenished by the exhalations of animals as they breath, by plants as they release gases, by forest fires that release CO2 along with carbon ash in smoke, and by the fumes from the rotting of dead plants. Volcanic eruptions and industrial processes also add CO2 to the air. Atmospheric carbon dioxide seems to have increased during the last century from some combination of volcanic eruptions, forest fires, and industrial processes. The relative importance of these three as causes of increased CO2 is not clear. Whether increases in CO2 in the air boost the yield of farm plants is a topic of study and debate. Like nitrogen and oxygen, CO2 is a colorless, odorless gas. Although neither nitrogen or oxygen has an influence on the greenhouse effect, for some reason CO2 is assumed by environmentalists to influence the greenhouse effect so as to cause global warming. We are all waiting for an explanation of how CO2 differs from nitrogen and oxygen in its influence on the greenhouse effect. Until such explanation is forthcoming, it seems reasonable to suspect that the theorists are failing to differentiate between wholesome CO2 and poisonous CO1 (carbon monoxide) and other toxic gases that accompany CO2 in industrial pollution. Why are the global warming theorists singling out a wholesome gas that is necessary for life on earth as the culprit of the impending disasters they are predicting? droplets gather into mist and mass as clouds and fogs. Warm mist air rises to meet cool higher air and condenses as water droplets in clouds, which fall to earth as rain. Fresh water is essential for life, and most plants and animals consist of over 70% water. Water on the land runs into the oceans and the evaporation of ocean water replenishes water vapor in the atmosphere. Industrial processes and forest fires release water vapor, but not in amounts that are significant relative to ocean evaporation. Water vapor is a colorless, odorless gas and has no influence on the greenhouse effect. However, water mist formed into cloud cover does retain some of the heat radiated from earth that is warmed by the sun, and does appear to produce a greenhouse effect. As we shall see in this analysis, most of the greenhouse effect comes from cloud cover. Increased cloud cover seems to produce mild cyclical warming spells on earth. Warming trends are reported by some historians to be times of good harvests, relative prosperity, and relatively-stable weather in the northern hemisphere — contrary to the warnings of the global warming Cassandras. cleansed from the air through the water cycle, if there is a reduction of sandstorms and a remission of volcanoes. However, scientists tell us the sandy deserts are increasing in size. Presumably, dust in the air is also increasing. This implies a moderate increase in cloud cover and a mild warming trend. Indeed, the "little ice age" tapered off about two centuries ago, and a gentle warming trend has been taking place ever since along with an increase in the size of sandy deserts. Dust can produce local conditions of haze. Whether haze influences the greenhouse effect is not clear. Industrial pollutants can contribute to haze and dust in the air. However, the quantities of dust from pollution are probably not material in relation to the dust produced by desert sandstorms, forest fires, and volcanoes. However, CO2 — a colorless, odorless gas — has no effect on dust, haze or cloud cover. Without the greenhouse effect, scientists estimate that the temperature on earth would fall to 100 degrees below zero Fahrenheit and the oceans would freeze. The greenhouse effect is essential to the survival of life on earth. The global warming theorists are worried about a runaway greenhouse effect that they presume to have occurred on the planet Venus resulting in extremely high estimated temperatures on that planet. The glass panes of a greenhouse admit sunlight that warms the interior surfaces of the greenhouse. These warm surfaces radiate heat, and the plants in the greenhouse produce some heat through the process of photosynthesis and the oxidation of plant tissues. The solid glass walls and ceiling of a greenhouse transmit some heat to the outside, but do so at a slower pace than the production of heat inside the greenhouse. Therefore, greenhouses can stay warm through the winter without central heating. Leaving the windows closed in a car parked in the summer sun can result in temperatures of over 100 degrees in the car — a microcosm of the greenhouse effect. Glass is a crystalline frozen liquid much like ice, except glass melts at a vastly higher temperature than ice. Glass refracts light, and light shining through glass objects can produce tiny rainbow images. Like glass, both water and ice refract light, resulting in rainbows or rainbow images. Clouds can refract light and produce rainbows because clouds consist of water droplets. Rainbows are more visible and spectacular just after a rainfall when the clouds begin to clear and sunbeams pierce the air when it is still filled with tiny water droplets. Since water droplets in clouds refract light in a manner similar to greenhouse glass, cloud cover as a metaphor for a greenhouse is logically valid. ice "sublimes" at 109 degrees below zero F, which means it turns directly from a frozen solid to gas vapor. Hollywood and Broadway use fuming dry ice to create the visual effect of an eerie fog. In the upper stratosphere, miles above the clouds, temperatures are low enough to condense CO2. However, there are no CO2 clouds at that altitude, because as dry ice crystals fall to earth and reach slightly warmer altitudes, they quickly sublime into CO2 fumes and dissolve into the atmospheric cocktail of gases. Unlike water mist in clouds but like water vapor in the air, CO2 gas does not refract light and has no greenhouse effect. Pilots use dry ice to seed clouds and induce rain. If this phenomenon can occur in nature without the help of pilots — which may be remotely possible during extremely cold weather conditions in polar regions — it would work against global warming. The seeding of clouds reduces atmospheric water vapor and thus reduces cloud cover, which in turn works against global warming. The burden of proof lies with those who claim that CO2 gas has a greenhouse effect, because they have presented no understandable mechanism or process that explains how CO2 gas in the atmosphere increases heat on earth. The greenhouse metaphor that is successful for water droplets in clouds appears to be a failure when applied to CO2 gas. If we receive evasions instead of answers and explanations from scientists on this crucial question, we have a right to conclude that global warming theory does not make sense, and we can consign it to the accumulating heap of junk science, along with the discarded theory of global cooling of thirty years ago. RenewAmerica analyst Fred Hutchison also writes a column for RenewAmerica. The views expressed by RenewAmerica analysts are their own and do not necessarily reflect the position of RenewAmerica or its affiliates.